Bosnia and Herzegovina lies at the heart of the Balkans. In 2007, the country became a full member of the Central European Free Trade Agreement. Most of Bosnia and Herzegovina's trade is with the European Union, and the nation profits from trade measures introduced by the EU. Thus more than 95 percent of all Bosnia and Herzegovina's exports including agricultural products enter the European Union quota and duty free. The country mostly exports clothing, metals and wood products. preferential export regimes with the following markets: USA, New Zealand, Switzerland, Norway, Japan, Russia, Kazakhstan, Belarus, Iran, Canada and Australia. Companies interested in doing business in Bosnia and Herzegovina should find a local partner who could be a distributor, sales agent or representative. Exporters should insist on advance payment, or have a confirmed letter-of-credit when doing business with a new local business partner. Export Portal is your gateway to international trade. We believe that exporting overseas is the key to the success of your company. Export Portal is the best opportunity to showcase your products online for the expansion of your export business. At exportportal.com online marketplace you can choose products from various Bosnia and Herzegovina manufacturers, Bosnia and Herzegovina Wood Suppliers and Manufacturers, Bosnia and Herzegovina Food Exporters and suppliers, Bosnia and Herzegovina Food Producers as well as check out the catalogue of Bosnian clothing brands, Bosnia and Herzegovina Foods andBosnia and Herzegovina Wood. If you plan to import from Bosnia and Herzegovina, explore our catalog of Bosnia products, Bosnian Distributors and Bosnian Manufacturers from the comfort of your home or office. Bosnia and Herzegovina lies at the heart of the Balkans. In 2007, the country became a full member of the Central European Free Trade Agreement. Principal exports of BiH include chemicals, machinery and equipment, fuels and food products. Bosnia and Herzegovina’s main import products are machinery and transport equipment, mineral fuels, lubricants and similar products, chemical products, food and live animals. Bosnia and Herzegovina’s main import partners are Croatia, Germany, Italy, Serbia, China, Slovenia, Turkey and Austria. It should be noted that Bosnia and Herzegovina has a significant foreign trade deficit with imports two times higher than exports. But as it has been recently announced Bosnia and Herzegovina import and export sector is set to receive a boost from business establishments from Malaysia. The main reasons behind this interest are massive regional market of BiH and various opportunities to investors and exporters in that country. 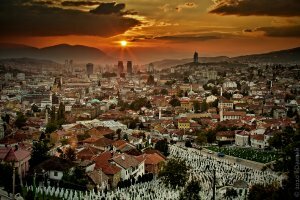 Are you a Bosnian Exporter looking for global buyers? Or are you an importer from USA or any other country from the world searching for top quality products made in Bosnia and Herzegovina? Export Portal helps you to sell and buy online products from verified Bosnia and Herzegovina manufacturers, Bosnia and Herzegovina Wood Suppliers and Manufacturers, Bosnia and Herzegovina Food Exporters and suppliers, Bosnia and Herzegovina Food Producers. Buy online trending import items from BiH such as clothing, wood and metals. Bosnia and Herzegovina is a member of Central European Free Trade Agreement. The country also has a signed Free Trade Agreement with Turkey. Bosnia and Herzegovina has preferential regimes with the European Union, USA, Australia, New Zealand, Switzerland, Norway, Russia, Japan and Canada. In Bosnia and Herzegovina import customs tariffs are: 0%, 5%, 10% and 15%, while 1% of customs value is paid for the purpose of customs registration. The tariff rate averages is 5.1%. Bosnia and Herzegovina has three common national-level food institutions: the State Veterinary Office, the Plant Health Administration, and the Food Safety Agency. The European Union has recommended the establishment of a national-level agricultural ministry, which will ensure that BIH has one competent food authority when negotiations for EU accession begin. In the absence of a national agricultural ministry, the Ministry of Foreign Trade and Economic Relations (MFTER) has taken the lead in food safety. An agricultural department supported with EU funds has been established within the MFTER, as the nucleus for the future agricultural ministry. Bosnia and Herzegovina has its own set of standards known as the BAS Standard. However, all EU standards are recognised. The Institute for Standardization is the main body responsible for standards. Technically complex products must be accompanied by instructions on usage, manufacturer specifications, a list of authorised maintenance persons/businesses, warranty information, warranty period, and other applicable data. All information must be translated into the languages of Bosnia and Herzegovina and affixed to, or accompanying the product. Product certification is required in order to make sure that the product has undergone appropriate testing and that it conforms to relevant regulations.